Whether you agree or not, a sumptuous feast is central to all Christmas celebrations. So, here is a traditional dish that is a must to have while celebrating Christmas. Try this easy to prepare Eggnog recipe and make this Christmas special. 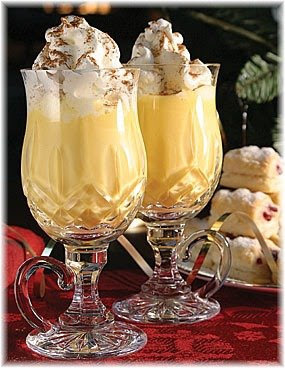 Sit with family and serve this delicious eggnog as a dessert. · Mix cloves, milk, 1/ 2-teaspoon vanilla extract and cinnamon in a saucepan and heat at low setting for about 4 minutes to bring the mixture to a boil slowly. · Take a large bowl and combine egg yolks and sugar. Whisk together until fluffy. Then, whisk hot milk mixture slowly in the eggs. · Pour the whisked mixture in a saucepan and cook over medium heat for about 3 minutes stirring it continuously. Don’t boil the mixture. · Strain the mixture to remove cloves and let it cool for about an hour. · Now, stir in rum, cream and 2 teaspoon vanilla along with nutmeg. Refrigerate it overnight before setting. Hi Shaina G, my name is Maria. This is an amazing recipe. I love all your recipes and I would like to try this one and featured on my blog, but giving the link back to here, as I always do with everything I publish. Thank you very much for your time, kind consideration and for the excellent recipes you bring to us. This sounds like my mom's recipe and OH, was it good. I will be trying this. TFS. Juanita in OH. Where can I purchase those glass mugs?